Dad and Matthew got their own table at the Ikea restaurant "Swedish Meatballs" where kids eat free on Tuesdays, with no catch. You should of seen my table with the other 6 kids. We didn't look quite so together! Anyway, we took a little vacation this past week and of course with traveling comes way too much eating out. So I thought I'd do a post on some tips for eating out with large family or even just eating out with kids. We do eat out, probably more then we should, even when we are not on vacation. My kids are a little spoiled that way, but here it goes with some things I've learned over the years. 2. "Kids eat free" nights can be great, but be sure to read the fine print. Many times they can only eat free with every adult meal purchased. Yes, that can still be a good deal but when your kids out number the adults 3:1, then it's not that great of a money saver. Ikea and Jersey Mike's are two places that don't require this on their "kids eat free" days. 3. Divide and conquer if you have to. Don't feel bad about splitting up the toddlers or letting the teenagers eat by themselves. This especially works if you're eating out with another family that has kids as well. Let the adults eat at a table right next to the kids (keeping very small ones with you of course) and then you actually get to visit! 4. Try to avoid the drive-thru trap. Yes, we do go through drive-thrus but only a very few restaurants and then we bring it home to eat or take it to a park. 5. If you are eating out, have some food in your purse for the little ones to eat while waiting on your order. Kids smell the food and then get even hungrier and that time waiting for the meal can seem endless. 7. Bagels and pizza, I have found, are definitely the cheapest for a large crowd. This is especially true if you bring it home and don't order drinks. 8. Speaking of drinks, if it doesn't come with the kid meal (if you are getting a kid meal) then we all order water. Soda, juice and even tea can set you back over a dollar a person. It's ridiculous! 9. And speaking of kid meals, many times at sit down restaurants they are a trap as well. I have found that it's cheaper to give my kids part of my meal or have them split a normal meal (many times between 3 kids) and have water. Check the prices. Never assume it's cheaper. Many times, this is what we really look like at a restaurant (with a friend in tow too)! Hi! 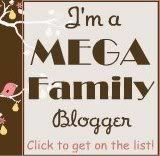 I love your blog... I've been an avid follower for quite sometime :) I recently started my own blog (3 posts so far!) about my life, my family, motherhood, etc. It is new and I do not have any followers yet. Would you like to follow/subscribe to my blog? In case you are wondering, I am a mother to 7 (almost 8 children! ), including 4 biological children and 4 adopted children. I also homeschool and have two children with special needs. I plan to blog about everything I just mentioned. Would LOVE if you'd follow/subscribe/spread the word about my blog! Sure Laura! Your blog is beautiful! Thanks for posting and for reading. Blessings on your new one on the way!